Besides being long — or perhaps because of it — Njal’s Saga is a tale that spans the world of Icelanders at the turn of the Millennium. It has great sweep and great scope. The main characters are all farmers, most of whom are not lords of any variety, but all of whom have some degree of local power and personal, if not vested/legal/judiciary, power. Like most lengthy mediaeval narratives, this is not a single story. ** There is no single, tightened plot with setting, problem, rising tension, climax, resolution, dénouement. *** This helps contribute to the scope of the saga. We have a multitude of Althings (Iceland’s yearly assembly of free, adult males where law was enacted and transacted) spanning most of the lifetime of our title character, Njal, and then beyond. Various people get married, occasionally divorced, more often widowed, remarried, have children, and so forth. Friendships are forged, murders are plotted, revenge is served cold, and compensation made, time and again. People voyage to Norway, the Baltic, Orkney, Scotland (of which Orkney was not then a part), Ireland. To try and discuss a work with such a vast number of episodes in terms of its ‘plot’ is very difficult. To do so would basically be to retell the entire saga. Therefore, I mention only one, although Gunnar’s Viking expedition, the conversion of Iceland, and the burning of Njal and family are as or more worthy of discussion, the last being the tightest of them all, a saga within the saga that ties a number of threads together and carries the plot forward for the last third of the book. Instead, to save space, there is a series of murders of retainers/slaves/farmhands on the part of Hallgerd, wife of Gunnar, and Bergthora, wife of Njal, while the menfolk are at the Althing for several summers running. Each year, a wife gets a dependent to murder one of the other family’s dependants, and the next year the murderer is slain in turn. Each year, either Gunnar or Njal makes compensation for the killing, for Gunnar and Njal are great friends. Their wives, it is clear, are not. Eventually, this series of yearly killings escalates until the murderers are Njal’s sons. Hallgerd does not provoke revenge, and the saga moves on. This bit of the story interests me because it reminds me of how Brunhilde and Kriemhilde’s petty jealousy in the Nibelungenlied (also 12th-13th-century) escalates first to Siegfried’s death and then the slaughter of all of the Nibelungs at Atli’s home, events I discuss here and especially here. The jealousy and envy of women leads to the death and downfall of men. Not a theme I’m willing to see represented in history any more than its inverse about men ruining women, but I do wonder how common it is in other Germanic literature of the Middle Ages. And what is the main theme that drives Njal’s Saga? Fate. Inevitability. One of the main characters is warned that if he does not leave Iceland after he kills a man, he will die. The day he is meant to disembark, he decides to stay home instead. He is burned to death in his house. Fate seized him. Throughout the saga, Njal has prescient knowledge and tells people, ‘If you do x, y will be the result.’ At one point he tells his friend Gunnar, ‘This is the beginning of your career of killing.’ When his time finally comes, Njal, his wife, and their foster son go and lie down in bed as their house is burned in retaliation for their sons’ crimes. This attitude is summed up by one Icelander who states something to the effect that death is something all men meet. **** It is a prevailing theme in much Old English and Old Norse literature, one which Peter Jackson stole from The Hobbit, as I’ve said. Njal’s Saga has everything — romance, violence, love, hate, farming, raiding, adventure, war, miracles, fate, doom. Try it out. You won’t be disappointed. Available on archive.org in the Everyman’s Library translation. Or find the Penguin translation from a local independent bookseller or public library! *If Snorri Sturluson’s Heimskringla, of which King Harald’s Saga is but a part, counts as a saga, it probably is. Perhaps it counts as a history? I dunno how these genre divisions break down in Norse literature. **See my first post on Beowulf and The Hobbit. ***Walter J. Ong, Orality and Literacy, says that this is a trait of oral ‘literature’ and has a long hold on storytelling in societies that where literacy is still the domain of but a few. ****Only it was poetic, like ‘a friend’ or ‘a foe’ or ‘a game’, but I was reading on a train and didn’t note the exact quote. This entry was posted in Books, History, Literature, Mediaeval and tagged fate, iceland, icelandic sagas, medieval literature, nibelungenlied, njal's saga, old norse, orality and literacy, vikings, walter j ong on December 23, 2013 by MJH. This is the final post in series on the Middle High German epic The Nibelungenlied. We began with variations, then moved on to history followed by deception and betrayal. We now come to vengeance. 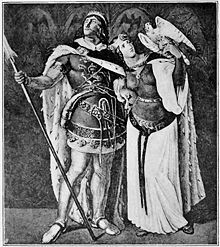 Siegfried, for all his might and glory, spends much of the action in the first half of the Nibelungenlied deceiving Brunhilde, getting betrayed, and lying about dead in a very fancy coffin. 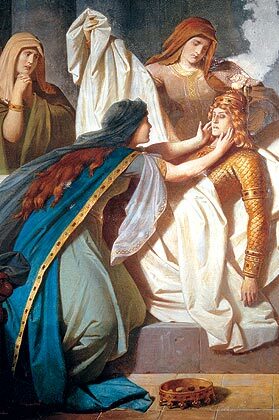 His wife Kriemhilde cannot overcome his death. When Etzel (Atli; Attila the Hun) sends someone to woo her for him, she refuses until she realises that she can use the power of this faroff pagan king to work for her advantage and avenge the death of Siegfried. So she marries Etzel and has some kids. After several years, she decides it’s time to kill off the rest of the cast of the epic. So she invites her brothers and their entourage to Hungary to hang out with them there. Hagen of Tronege, Siegfried’s betrayer, knows that she hasn’t forgiven him for that or for stealing the treasure of the Nibelungs from her and then sinking it in the Rhine. So he tells everyone this is a bad idea. But everyone thinks him a coward, so to save his pride, he goes with them to Hungary. As they cross the Rhine, Hagen’s fears are confirmed by some water sprites who say that everyone except the chaplain will die. They have some fun along the way, meet some people, marry off one of Kriemhilde’s (innocent) brothers, have some jousts. The usual sort of thing. Then, about halfway through the second half, they arrive in Hungary. There’s some more jousting. Then they have a feast. And then everyone dies. It takes about one quarter of the epic for Kriemhilde to exact her revenge. Not only the guilty Gunther and Hagen die, but her innocent brothers Giselher and Gernot, almost all of Etzel’s men, and people who have nothing in stake in the dispute such as most of Dietrich of Bern’s men. It takes a long time to kill that many people, let me tell you. I have to confess, I have never read a piece of literature so devoted not simply to revenge but to full-scale slaughter as the Nibelungenlied. You would think the Iliad would come close, but there’s a lot of fighting there that doesn’t end up with ten, twenty, a hundred people dead in five lines of poetry. I mean, this is the atreia of Achilles writ large, but with no Homeric similes or random anecdotes about someone’s father or the gods to break the sheer slaughter of the thing. I thought things were going to slow down when Kriemhilde set the banquet hall on fire – like in Icelandic sagas, you know? But no. We still had to kill off Dietrich of Bern’s men. Here we see the pointlessness of revenge. Revenge is often central to heroic conceptions of virtus, of manliness. The primeval code it comes from is, ‘Help your friends, harm your foes.’ Thus the Iliad. Thus Medea’s murder of Jason’s second wife. Thus Roman military practices across the Rhine-Danube frontier. Thus The Count of Monte Cristo. Thus Star Trek II: The Wrath of Khan. As with Khan, vengeance consumes Kriemhilde. Hagen even refers to her as a she-devil. Vengeance is all there is left to Kriemhilde in the years following Siegfried’s death as she broods alone in Burgundy and then pretends to play the life of a happy queen in Hungry. And who are Kriemhilde’s true enemies? Her (penitent) brother, Gunther of Burgundy. And who dies because of Kriemhilde’s vengeance? Her two other, beloved brothers. Thousands of other Burgundians. Thousands of Huns. Rüedeger and his court. Dietrich of Bern’s men. Thousands slaughtered because of one woman’s revenge. I believe that Dietrich’s presence in the Nibelungenlied is meant to underscore the futility and destructiveness of Kriemhilde’s vengeance. Almost all of his men are slain, solely because of feudal loyalty and Kriemhilde’s insistence that they get involved in a quarrel not their own. Now, as you may recall, Dietrich of Bern is inspired by the long-distant memory of Theoderic the Great, Ostrogothic King of Italy in the early 500s. His presence in this poem ties the Nibelungenlied to the world of wider Germanic heroic literature, much the way Hercules voyaging with Jason connects the Argonautica to the world of wider Greek literature. You see, Dietrich of Bern has a whole series of epic poems about himself that predate the writing down of the Nibelungenlied. 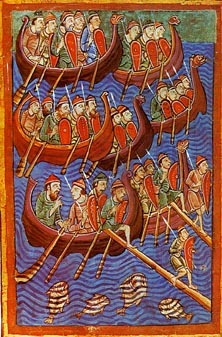 In this poem he may be an incidental character, but in those others, guessing from Cyril Edwards’ notes to his translation of the Nibelungenlied, he is not simply a major figure but a central liege with many heroes surrounding him, much like King Arthur or King Hrolf Kraki (who only gets one saga, though). For this mighty man to lose so many of his mighty warriors, then, points to the sheer, utter destructiveness of vengeance. These deaths are harmful and ruinous, pointless and senseless. The sheer pointlessness and senselessness of their deaths underscores the futility of revenge. A cold dish, it is not very palatable and does not warm the heart. It leaves you empty and alone, stained with the blood of your loved ones. Thus, again, does the Nibelungenlied subvert our expectations of heroic poetry even as it fulfils them. This entry was posted in Books, Literature, Mediaeval, Movies and tagged argonautica, cyril edwards, dietrich of bern, heroic poetry, kriemhild's revenge, kriemhilde, medieval epic, nibelungenlied, revenge, subversion, wrath of khan on July 3, 2013 by MJH. Siegried’s deception, discussed last time, brought the hero to his doom. For when that deception became known, the honour and dignity of two proud women was disturbed. And so the violent, vengeful Brunhilde decides to take Siegfried down. She goes to her husband and his retainers and successfully recruits Hagen of Tronege to her cause. The Lord of Tronege convinces Gunther to join him in the next deception of the epic. This time, it is Siegfried and Kriemhilde who will be deceived. The Death of Siegfried. The death of, as one documentary puts it, the Germanest hero of all. I’m not, mind you, sold on the idea that Siegfried is the deutschster hero and the Nibelungenlied the deutschster epic. But that’s what they say. This scene, this episode, was the basis for the first of the operas Wagner composed for the Ring Cycle. Originally to be The Death of Siegfried, it is now Götterdämmerung. This betrayal cuts deep and its aftermath is the entire second half of the epic. It is also a direct consequence of the deception in last post. When modern critics of the poem praise Siegfried to the sky, they fail to miss this. They fail to notice that it is not simply the betrayal of his friends, of Hagen and Gunther, that brings about Siegfried’s death. It is not just the jealousy and envy of a powerful woman. It is his own action. Siegfried’s death is a consequence of Siegfried’s life. Once again, although he qualifies as one of the great and mighty men of epic and heroic literature, is he meant to be a shining beacon of light, truth, and virtue? Or are the deception on his part and the subsequent betrayal meant to subvert the vision of the mighty man? Do we actually have, embedded in this undoubtedly heroic epic, a criticism of the typical construction of masculinity in heroic literature? Does our ‘final poet’ – or his predecessors – subvert, just a little, the great epic hero to make us rethink what virtus, ‘manliness’, really is? For Hagen, the betrayer, proves himself as cunning and mighty in battle as Siegfried throughout the epic, especially in the second half. Yet he is the one who literally stabs Siegfried in the back. He is otherwise a loyal, proud warrior, who is a fantastic jouster in the book’s many, many jousts, and a skilled swordsman. But when the terrible vengeance and slaughter of the second half of the epic play out, Hagen of Tronege falls prey to the consequences of his own actions as well. His betrayal of Siegfried and his attempts to escape his fate drive the rest of the book. But he knows that he, too, will die. All of our actions have consequences, and no matter how mighty a warrior a man is, those consequences can catch up to him. This entry was posted in Art, Books, Literature, Mediaeval and tagged achilles heel, betrayal, death of siegfried, fafnir, goetterdaemmerung, hagen of tronege, medieval epic, nibelungenlied, siegfried, sigurd on July 2, 2013 by MJH.